Announcement Eco resin jewelry, bangles and rings in a rainbow of colours featuring metallic leaf flakes as well as beautifully preserved natural and cruelty-free parrot feathers, shells, leaves and more. We create all our moulds by hand, use high quality materials, and sand these pieces to perfection! The result? An everlasting piece of wearable artwork. 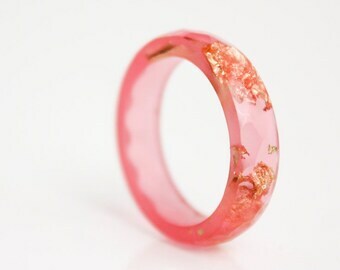 * Resin is more fragile than metal rings - its consistency is similar to ceramic or shell. If enough direct force is applied, it could break. We recommend removing jewellery before manual labour (such as gardening). * If the surface is scratched, it cannot be repolished to a shine. Remove before using abrasive scrubs. When not wearing, store in a soft bag or box. * Keep away from chemicals and alcohol-based products including perfume and nail polish remover. * The surface of resin may be slightly porous. For this reason, we recommend removing before working with mud, dirt or ceramics that could be absorbed. * Exposure to extended amounts of strong sunlight isn’t recommended. When you’re not wearing your jewellery, it should be kept out of direct sunlight. * We’ve found resin jewellery to be water resistant. While we haven’t done extensive testing, it holds up well to everyday handwashing or showering. * To clean, use baby oil or mild soap with a soft cloth. Eco resin jewelry, bangles and rings in a rainbow of colours featuring metallic leaf flakes as well as beautifully preserved natural and cruelty-free parrot feathers, shells, leaves and more. Love this ring, thank you. I love it. Beautifully made. Matches earrings and necklace that I had purchased elsewhere. Very very happy. It's almost New Year's Eve. Ready to sparkle? We're shipping off last minute packages. Keep calm and stay warm, everyone! Mixing colours is always a fun experiment - albeit a messy one. Mixing, degassing, and pouring silicone rubber for mould making. Supplies which we feature in our jewelry. Mixing up some liquid eco resin. We proudly use Entropy resins. The story: We are two sisters, 10 years apart, who love making wearable works of art. While living in Melbourne, Australia, Jessica took a mouldmaking and casting course and around the same time developed a serious feather-collecting habit. Upon returning to Canada, she taught Gwynne everything she knew. With Gwynne's superior eye for design Rosella Resin was born. The company is named after the beautiful Australian parrot. The concept: Nature is the world's greatest designer. Rosella jewelry showcases the most beautiful designs found in nature, including feathers, shells, and plants. Rosella Resin is proudly made using Entropy Resin's eco performance resin, certified by the USDA as a biobased product. Unlike most petroleum-based resins, this eco resin incorporates bio-derived materials such as pine oils derived from waste-streams of other manufacturing products. The process: First we create every mould with high grade silicone rubber. Inside the moulds we place collected natural objects or metal flakes and colours. We then cast our jewelry using bio-derived eco resin. Eco resin has a longer cure time than traditional resins takes over one week to cure. After the jewelry has cured, we remove the pieces from the molds, and carefully sand and polish using over 15 grades of sandpaper and polishing tools. The important part: We are nature lovers who are committed to environmental ethics. We use bio-derived eco resin to create our jewelry. Parrot feathers are cruelty-free and naturally molted. We only use natural feathers, never dyed feathers. The vibrant colours are the bird's natural feathers. Rosella jewelry is elegantly packaged and comes wrapped in a gift box so it’s ready to gift! We ship all our packages with Canada Post. If you would prefer a faster method of shipping, please contact us before purchasing to arrange. We are sisters and co-creators of RosellaResin. See more about each of us below by hovering over our portraits. Nature lover living in Canada's capital. Bit of a wanderer. Interests include getting off the beaten path, scuba diving, campus/community radio, cats. While in the studio, I like to have a steady stream of Law & Order playing in the background. I'm the youngest sibling in my family who, instead of cartoons, watched Martha Stewart after school. I probably spend too much time on the internet and always have too many projects on the go. Also, I like chocolate. Nature is the world's greatest designer. Rosella jewelry showcases the most beautiful designs found in nature, including feathers, shells, and plants. Each piece is unique. When you wear our jewelry you can be assured you are wearing a one-of-a-kind item that can never be replicated. Rosella jewelry is cast from handmade moulds and cast with bio-derived eco resin. Parrot feathers are naturally molted and cruelty-free. The company is named after a parrot native to Australia. We want everyone to enjoy wearing RosellaResin jewelry and it's important to us that you are completely satisfied with your purchase. Items may be exchanged or refunded if returned within 45 days from purchase date. Original and return shipping cost are buyer's expense. Payment is due within 24 hours of choosing an item in our store. We accept Paypal, which allows you to use your debit or credit card. Please do not select 'Other' for your method of payment unless you have a gift certificate. We also now accept direct payment through Etsy, where you have the option of paying via credit card, debit card, or an Etsy Gift Card. Your package will be shipped within 2 business days. Our shipping prices are higher than other jewelry because the size of our jewelry means it has to be mailed as a package, rather than in an envelope. Resin jewelry is carefully packaged and shipped via Canada Post air mail because this is the most economical option for the buyer. Please note that this service does not include delivery confirmation or tracking. If you would prefer to use a faster shipping method (ie courier) please let us know and we will let you know the price. Internationally, including USA: air mail generally takes between 2-3 weeks. Please note these times are not guaranteed, and tracking is not available with regular air mail. These are estimates only and we have experienced some packages in transit longer, especially during busy periods like the holiday season. If you'd like to upgrade shipping, but don't see an option for your destination, please get in touch and we will happily get a quote for you. Please note that choosing the wrong upgrade may result in delays. The following are the preset shipping upgrade options. Please provide telephone number in 'Note to Seller' upon checkout with a shipping upgrade. Unfortunately we cannot change the sizes of the listed rings or offer custom sizing. Make your hand into a small shape (as if you were going to put on a bangle.). Measure with a measuring tape around the widest part of your knuckles. Compare this with the inside circumference measurement on the listing to be sure the bangle will fit over your knuckles. 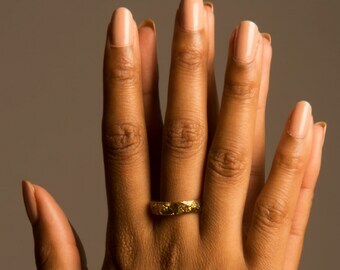 The most accurate way to know your ring size is to get it sized by a jeweller. For wide band rings (anything except the 'thin rings' in our shop) we recommend going a 1/2 size to a full size up for a more comfortable fit. Sorry, but we are not able to accommodate custom requests. The metallic flakes we use are imitation gold (85% copper 15% zinc), silver (100% aluminium), copper (100% copper) and a mix of copper and zinc (variegated.) Metal flakes are covered by resin making this jewellery a good choice for those with allergies to metal.